Proposals refer to published requests or offers, sometimes with what is expected in return. Agreements can evolve from proposals, or be entered into without proposals. They are specifically committed to by agents. Proposals are everywhere in advertising. But we see many groups posting proposals that are different from commercial advertisements or e-commerce offers. Proposals can stay directed to broad or specific audience. In the broadest case, they stay available for anyone (public proposals). In the most narrow case, the stay available only for specific agent. In between those two extremes a whole spectrum exists, for example two distinct proposals can exist on providing particular product or service - one for club members and one for general public etc. They are more general, often not commercial at all, expressed not in identified products but in categories, tags, and text. But they want to find each other. The offers want to find the matching requests. The requests want to find the matching offers. When they find their match, those with the matching offer and request enter into a conversation for action which might result in an agreement, possibly an exchange agreement. 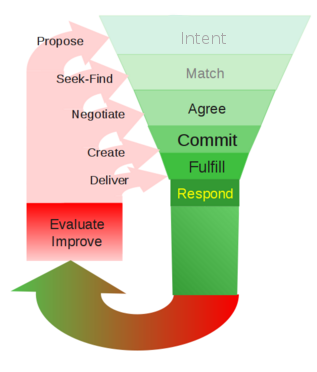 A proposal to do something might enter into conversation for action which might result in commitments for a process.